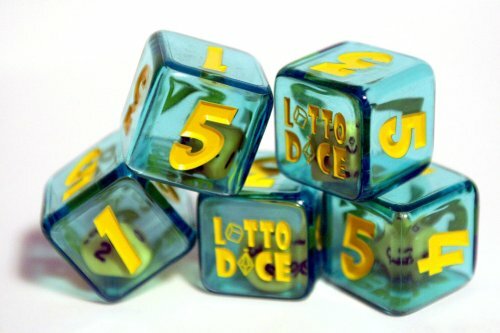 The unique and fun Lotto Dice are here! This popular item allows lottery players to randomly roll lottery numbers from 0-59. These random numbers can be used to play almost any lottery. The unique double die design makes it easy and fun for players to select their potential winning lottery numbers. The outer die is numbered 0 to 5 (0 is represented by the “Lotto Dice” logo). The inner die is numbered 0 to 9. 1) Roll the Lotto Dice double die. 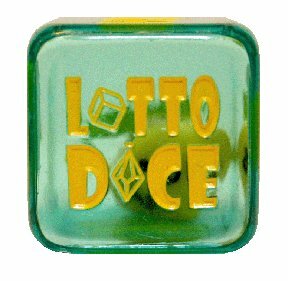 2) The number showing on the top of the outer die represents 10,20,30,40,50 or, if you rolled the Lotto Dice logo, a 0. 3) The number on the top of the inner die is then added to the result from the outer die. Example 1: If you roll a 3 on the outer die and a 5 on the inner die then the result is 30+5=35. Example 2: If you roll a “Lotto Dice” logo on the outer die and a 7 on the inner die then the result is 0+7=7. Note: If you roll a number that is not valid for your lottery then simply ignore it and re-roll the Lotto Dice. 4) Mark each result on your lottery ticket and repeat the rolls until all of the necessary numbers have been selected. You can even roll your numbers in advance, write them down and when you purchase your ticket(s) quickly fill in your very own randomly rolled Lottery numbers!Lotto Dice is more fun than Quick Pick. Roll your Lotto numbers for Power Ball, Mega Millions or any lottery with a number range of 0-59. 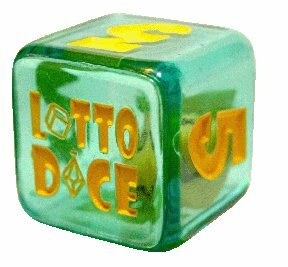 Using Lotto Dice offers a statistical random method for selecting lotto numbers. Give Lotto Dice to a friend and give yourself a chance to help a friend win the lottery. Best Wishes, from Day Dream Games!